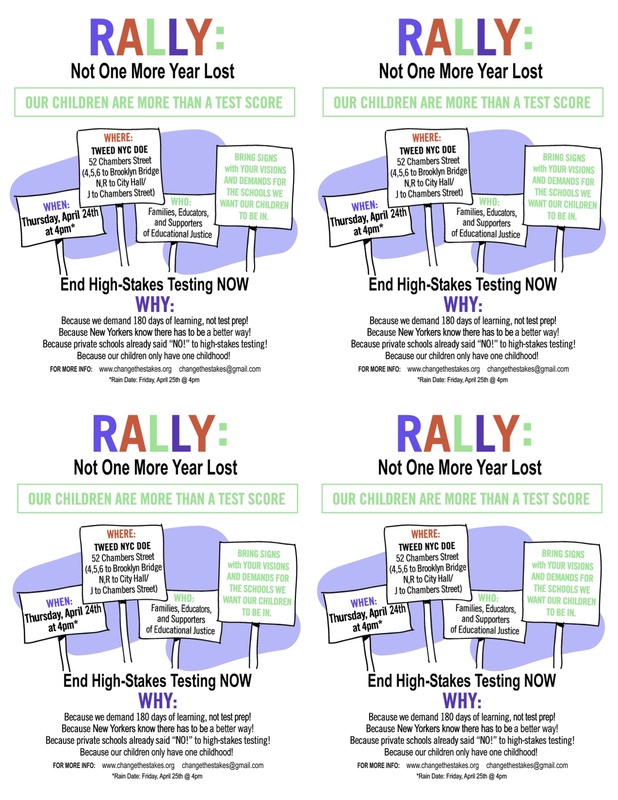 Please join us for rally and press conference to demand Not One More Year Lost – Our Children are More than a Test Score! WHY: We will be uniting to demand policies that support our children and our schools. Here I go again: what is the point of these “protests” which make participants feel better for an hour or two but which have absolutely no effect in changing the real world or anything to do with education policy in NYC? The protests are just a piece of the overall process CTS is engaging in – going to local CEC meetings, drumming up support for the opt-out movement. Remember that a year ago CTS pulled out 500 people to the steps of Tweed. Many of those stayed involved. Protests are part of building capacity. But there is also an aim – the math tests are coming. CTS and other testing groups got some major media publicity a few weeks ago. I generally trust the CTS steering crew to make the right overall decisions since they have been so successful in grassroots work so far. Sorry – the comment below was Norm while logged onto the MORE site.